Despite the ridiculously sad performance of Rock Revolution, Konami soldiers on, announcing the rebirth of Karaoke Revolution on all three consoles, two of which already have dedicated karaoke games. Flying in the face of games like Microsoft's Lips and Sony's SingStar, the new Karaoke Revolution for the Xbox 360, PlayStation 3, and Nintendo Wii seeks to single itself out by including more game play than your average singing video game. This includes a career mode for the solo artists, and team-based multiplayer. The game also features fourteen different customizable venues, with players of the 360 and PS3 able to use the consoles' respective camera peripherals to record themselves, playing the footage back on screens within the environments. As for music, Karaoke Revolution will ship with fifty different master recordings, with the PS3 and Xbox 360 promised more by way of downloadable content. Unfortunately the announcement didn't reveal any of the actual song titles, so we're pretty much in the dark for the time being, aside for a few hints offered by the screenshots on the official website. I'm seeing lyrics from Elton John's "Rocket Man" and Coldplay's "Speed of Sound". I can certainly see the angle Konami is taking here. Where Lips and SingStar don't offer much more than singing along to music videos, Konami is trying to add a little more game play to the mix. I just think the other titles are far too entrenched on their consoles to be toppled by another game, returning favorite or not. Still, one has to admire the guts of the company, releasing another Revolution title after their last attempted coup fizzled and died. 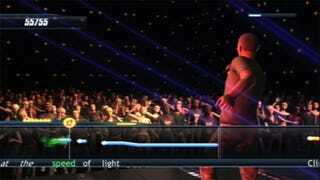 Karaoke Revolution is due out in the fourth quarter of 2009 on the PS3, Xbox 360, and Nintendo Wii.